The tenth and the last day of the ten day long Dusshera festival is Vijaya Dashami. Vijaya Dashami occurs in the Ashwayuja Month of lunar calendar. Vijaya Dashami occurs on sukla paksha Dashami or on the tenth day of the waxing phase of the moon. Vijaya Dashami of this year will be celebrated on Monday, 15th October 2040 . 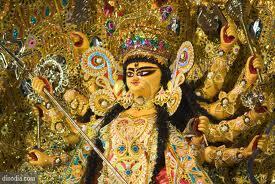 Vijaya Dashami is a symbol of victory of good over evil. As can be seen from the name Vijaya Dashami, where Vijaya means victory. Any work that is started on Vijaya Dashami is believed to succeed. Hence lot of people would want to start any new work or businees on Vijaya Dashami. It is believed that it was on Vijaya Dashami that Rama had defeated and killed Ravan in a battle. It is also believed that the Agnat Vaas of Pandavas ended on Vijaya Dashami. Agnat Vass means, Agnat means not identified, Vaas means staying which means to stay for one whole year without being identified as Pandavas. It is believed that Pandavas hid their weapons on Sami tree before entering the Agnat Vaas and prayed to the Sami tree to protect the weapons. Hence it has become a ritual to visit the Sami tree on Vijaya Dashami and pray to it. Pandavas took their weapons back on Vijaya Dashami from Sami tree. Hence a ritual of worshipping the weapons on Vijaya Dashami is there which is known as Ayudha Puja. All machinery, vehicles, instruments are washed, cleaned and worshipped. All these are kept idle for one day after worshipping on Vijaya Dashami. Visiting of Goddess Durga temples is also prominent in some parts of the country. Vijaya Dashami is celebrated all over the country with lot of enthusiasm.